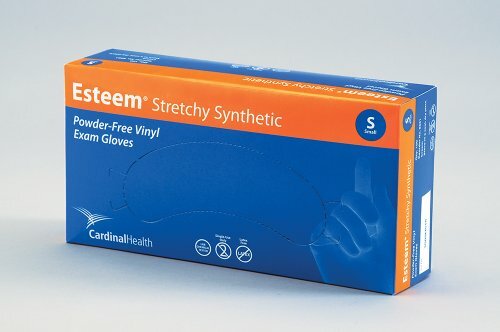 Esteem Stretchy Synthetic examination gloves from Cardinal Health are made from a special vinyl formulation that enhances elasticity and fit. They are soft and flexible, don easily and feel natural. These gloves are ideal for short-term use (less than 15 minutes) where there is minimal stress on the glove and a low-to-no risk of exposure to blood or other potentially infectious materials. Gloves are powder-free and not made with natural rubber latex. Cream color, stretchy vinyl has a nominal fingertip thickness of 4.7 mil (0.12mm).